Kai Lenny and Zane Schweitzer Battled it out at the Rock for the Standup Showdown Championship. The Showdown exceeded expectations. The wind had died from the day before and Pistol was definitely rippable. Zane Schweitzer and Diego talked up the contest so we had 25 entries. Robby Naish took his board out and was ripping all day. It was not possible to not be stoked from the start. Bernd & Norm Roediger joined Zane Schweitzer and World Champion Kai Lenny in the finals. The lineup was ripping for over a quarter of mile. I will be posting more video up this week as I work through it. After the final Zane and Kai were tied and they had a surf off. Here is the footage. Way to epic to film these guys twice in a break that had never benn paddeled befor so they had a surf off. Way stoked to get to film 2 top five paddelers all day on the Southern Oregon Coast. Kai Lenny "Pistol is Rippable"
The Showdown exceeded expectations. The wind had died from the day before and Pistol was definitely rippable. Zane Schweitzer and Diego talked up the contest so we had 25 entries. Robby Naish took his board out and was ripping all day. It was not possible to not be stoked from the start. Bernd & Norm Roediger joined Zane Schweitzer and World Champion Kai Lenny in the finals. The lineup was ripping for over a quarter of mile. I will be posting more video up this week as I work through it. I will start with the first final and end with some great footage of Robby Naish. After the final Zane and Kai were tied so they had a surf off. Way stoked to get to film 2 top five paddelers all day on the Southern Oregon Coast. I've been trying to get some people out in front of the Beachcomber for a couple of years. When I was downloading the video Skyler, Diego, Josh and a ton of guys came up to the demo boards and headed out to the break in front of the inn where Zane Schweitzer was ripping it. The Beachcomber was way cleaner than Pistol and I was super stoked to film. The word back was everyone wants the contest in front of the Beachcomber. More footage on the way. After breakfast I grabbed some of the guys for some impromptu interviews. Here are some clips of Kai talking about the surf at the Beachcomber and Pistol. I have thrown in some footage of the Beachcomber and Pistol so you can see what they were talking about. Bottom line the contest exceeded all expectation. We are ripping out some walls and are ordering more boards for the SUP shop. The 9� Hokua was a hit as well at the Starboard Widepoint. How many Board Shops can you demo boards at on a break endorsed by two of the top guys on the Standup World Tour? It's Official. The Inn of the Beachcomber has a rental fleet. SUP Rentals now on the southern Oregon Coast. How cool is that now you can make the drive and leave the boards to us. It's official we are signed up with Starboard and Naish as a dealer and the boards are on they way. We expect to have everything in place after the American Windsurfing Tour's first stop at Waddell Beach California in early May. The Inn of the Beachcomber is the only Southern Oregon Coast rental center. Check out theses awesome Stand Up Paddle Boards to rent. We have the five Starboard at the Beachcomber and 5 Naish SUPs on order. We are working on the details for the wetsuits and boots. When I was down last week I took the Avanti out on the Rogue River and burned up in my 5-4-3 excel wetsuit. Mark your calendars for June 16th through the 19th as some of the Stand up Paddle World Tour's top talent comes to Gold Beach Oregon. 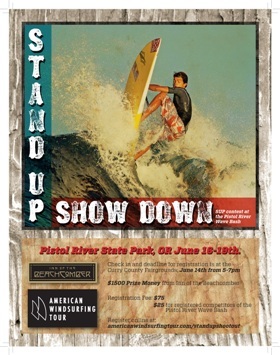 Got an email confirming Stand up World Tour Champion Kai Lenny is confirmed for the Stand up Shootout at Pistol River June 16th through the 19th. Kai Lenny will join Zane Schweitzer and Bernd Roediger as the Stand up Showdown is sure to offer a real treat for the stand up paddle community on the west coast. The Inn of the Beachcomber has donated $1,500 in prize money for a SUP Showdown competition to be held at this year's Pistol River Wave Bash this June 16-19th at Pistol River State Park, OR. Check-in and the deadline for registration is at the Curry County Fairgrounds on June 14th from 5-7pm. 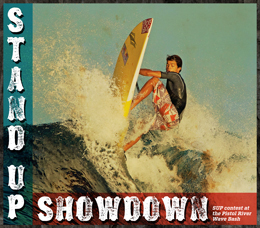 Register now online and find more info at American Wind Surfing Tour Stand Up showdown. There is talk that NAISH team rider Bernd Roediger is willing to put on a clinic. We are talking about a SUP clinic focusing on surfing. Starting with equipment, boards, leashes, paddle, fins and setup. Then getting out through the break to catch some waves and basic moves. Bernd would follow up with a question and answer session and an on the water session. The plan would be to do it early one morning at the Inn of the Beachcomber. Look for more information as we get closer. It would certainly increase the stoke having one of the top Naish surfers giving his incites into a discipline that hails from the islands of Hawaii. Flying in and want to give it a try? Check out our new rental fleet. Naish and Starboard reps will be on hand to promote the SUP in the northwest. Click the link above to registrar. Need more information? Email the Inn of the Beachcomber and I will get back with you.